I first heard of Sensory Deprivation Tanks, also known as Float pods or float tanks, from a video Joe Rogan put out on YouTube. 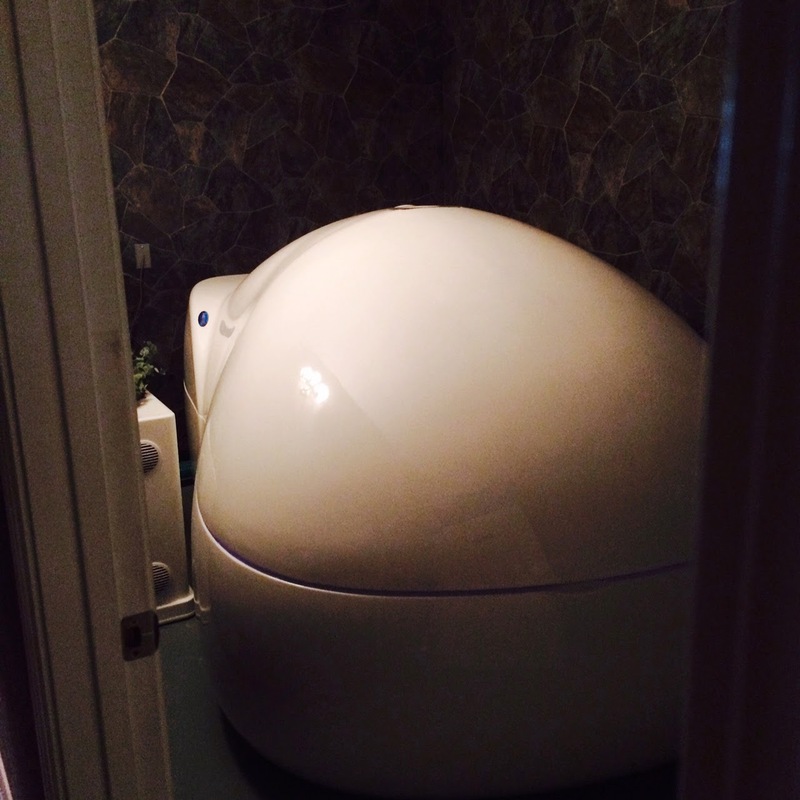 Float pods are these giant alien looking tanks filled with water and 800 pounds or more of therapeutic grade epsom salt. Inside the tank your body will float as if suspended in mid air, and once you close the pod door, you will no longer see, hear, or feel anything, allowing your body to shut down 90% of it's functions. It seemed like something pretty bucket listy to do, so I added it to my list. I found out last year there is a place in Houston that had recently opened called True Massage Floatation Spa, so I did a little research and found they had discount Groupon coupons. I bought one, and called True Massage to make the appointment. I spoke to the owner, Jeff, who in person seems like a pretty intimidating guy until you hear him talk about his immense enthusiasm for floating and his joy for life. He spoke to me for quite a while answering my questions, telling me about the benefits of floating, and tips for how to have the best float. It's difficult not to feel excited about the experience talking to Jeff. We spoke about how floating seems to have a sort of image of being for "hippies" or people who do psychedelic drugs, but how beneficial it truly is for anyone. 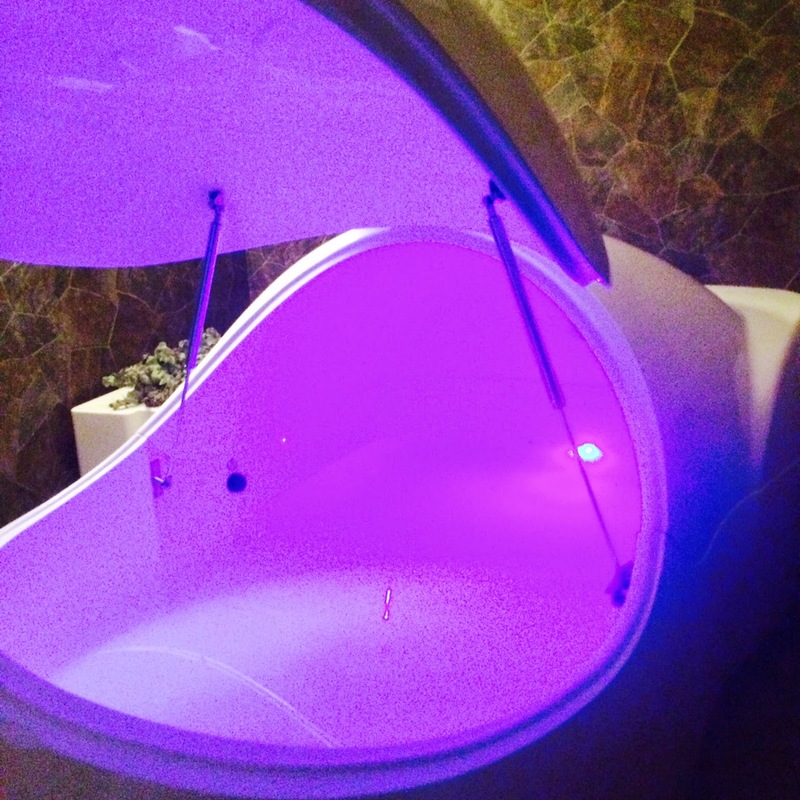 Yes, there is a strong spiritual benefit to floating and he told me stories of clients who had walked out of their pods crying over emotional breakthroughs and having found answers to many issues during their floats. And yes, it's true that some floaters can experience non-drug induced hallucinations. However, there are a myriad of physical benefits as well. Many athletes use float tanks and swear by the increased performance it gives them. Fibromyalgia sufferers find it a tremendous help. 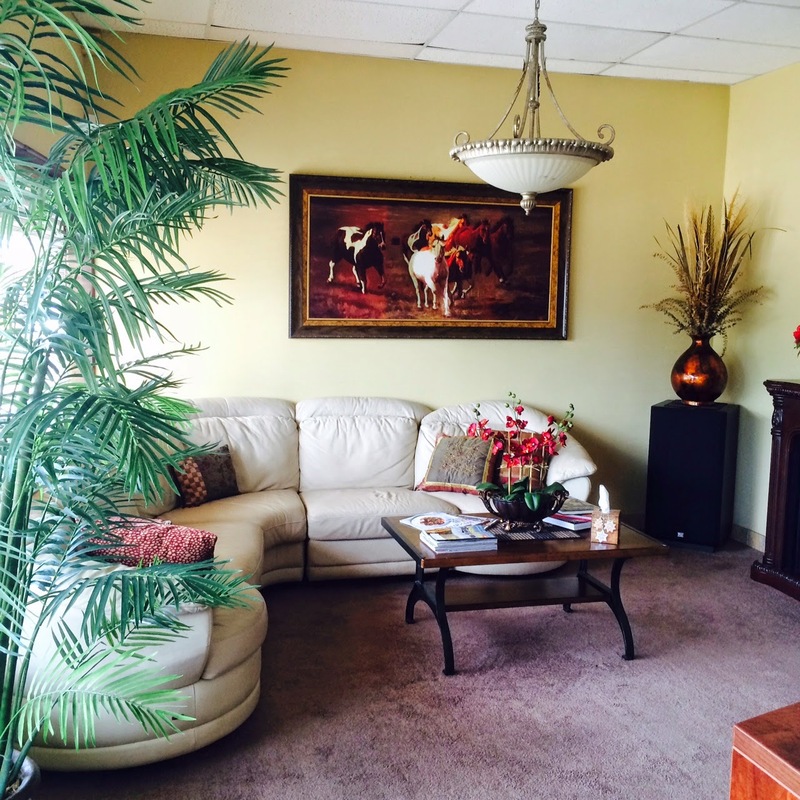 Elderly clients call it the fountain of youth. It relieves stress, tension, muscle pain, heck, the salt water is even amazing for your skin and hair. Friday morning, I did as Jeff instructed and did not wear any hair product, make up, deodorant, lotion or anything else that could gunk up the salt water. Being as this is Houston and even in Spring it was in the 80's, I was glad I had made an early appointment. I arrived at the floatation center, located off of Westheimer and Dairy Ashford in Houston, at noon and Jeff was already waiting to show me to my float room. I was led down a hallway to a dark, peaceful room containing a massive pod that looked sort of like Eva from the Disney movie Wall-E. 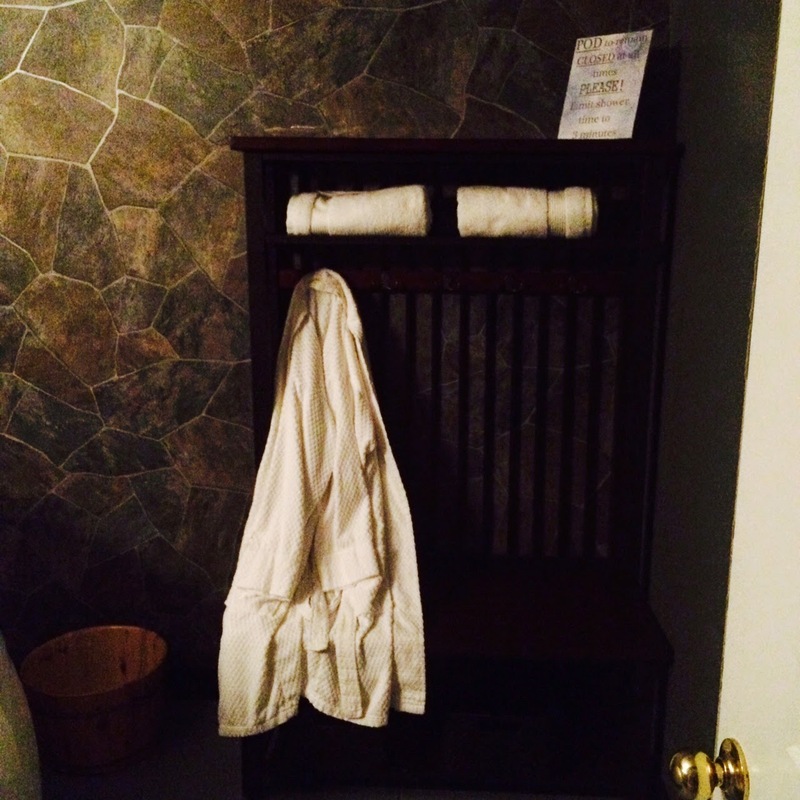 He instructed me to change into a soft fluffy robe that was hanging on a bench in the room, bring a towel, and walk across the hall to the bathroom to rinse off to get off any dirt, sweat or anything else that might be on me before I got into the pod. The shower area was one of the largest I've ever seen. It looked like the size of my first apartment! As I got cleaned off, Jeff had the room prepared for me. He showed me how to get into the pod, how to turn the soft interior lights off (which were glowing a nice blue), showed me where the ear plugs were and how to insert them, and let me choose between nine or ten different music options for the first ten minutes of the float. I don't remember all of the options, but I ended up choosing ocean sounds. 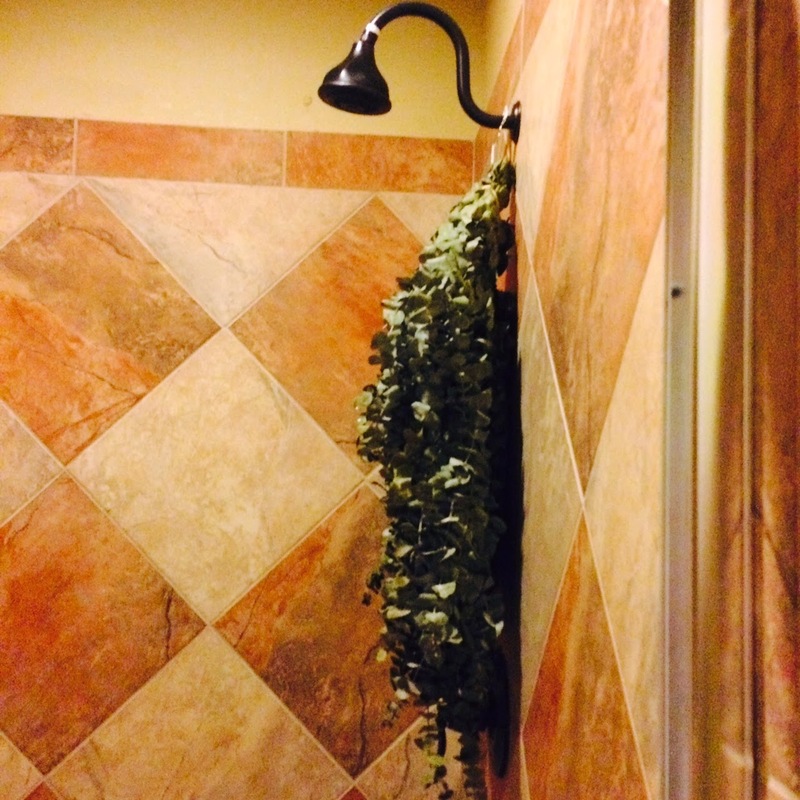 Jeff left, I turned off the room lights, dropped the robe, and climbed in, I'm not going to lie, I was nervous. What if I felt claustrophobic? What was I going to do with myself for an hour with no stimulation? What if I experienced hallucinations? What if I didn't experience anything at all? I laid down and immediately my body wanted to float. I grabbed a bar inside the pod and eased myself back. The water and air were body temperature, maybe slightly warmer. The ocean sounds started to play and I laid there for a minute just getting settled in before finally reaching over and turning off the blue light. Everything went pitch black. The air was warm and humid which made it a bit hard to breathe. It was unsettling at first, but I got used to it after a minute. Soon the music went off and I knew ten minutes had passed. Now it was just me and my own thoughts, I tried not to think, but ended up thinking about not thinking. I thought about what I would say in my blog, I thought about the Live Below the Line challenge I was doing in a couple days, and for awhile my brain even insisted on listening to Pantera and kept playing one of their songs. The more I tried to stop thinking, the more I thought. Then I remember a trick Jeff had taught me, and put my hand under me and touched the bottom. It's a lot harder than it sounds, I tried to count to 60 but only got to about 24 when suddenly my arm filled with helium and began to float away, I could feel it rising higher, higher and higher until it went so far into outer space I worried I would never get it back. A minute later a white light came on directly over my head. I blinked, and it didn't go away. It wasn't a bright light, but like a single Christmas tree light bulb softly illuminated above my head. Slowly it dimmed and blinked out. I began to feel myself spiralling, but I didn't get dizzy. My body began to melt into water, and I couldn't tell what was me and what was the water in the tank. I laid there feeling myself spread out like an ocean when suddenly my head jerked forward abruptly and I jolted up a bit, sending waves through the tank. I was back together, my left arm was back and my heart was racing. I figured it had only been maybe 20 minutes at best, so I tried to calm myself back down and try to get into the theta brain state. That's when the ocean sounds began again, My session was done. It hadn't been twenty minutes, it had been sixty! I opened the pod door, eased myself out and in a daze managed to locate my robe, put it on and take another shower to get the salt water off. I came back to the room, got dressed, and in my daze I ended up leaving without saying goodbye to Jeff. Thankfully my husband had driven me there, because I didn't snap out of things until I was halfway home. It was like waking from a beautiful dream. For the rest of the day I felt relaxed, peaceful, like I'd woken from a full uninterrupted nights sleep, like the one I got that same night, I've never slept so well! We had a massive storm hit us that night, and I slept like a log through it all. The next day I bought myself another Groupon for another float, and got one for my husband as well. He works so hard and has done so much overtime lately, he really needs an hour of complete and total rest on every level. I can't wait to see what my next float brings. I hear you really need three floats to get into it enough to start feeling the complete benefits. I think I'll be a float customer for life!